Situated at the finest locations at the resort, these four luxurious suites offer an average of 111sqm. 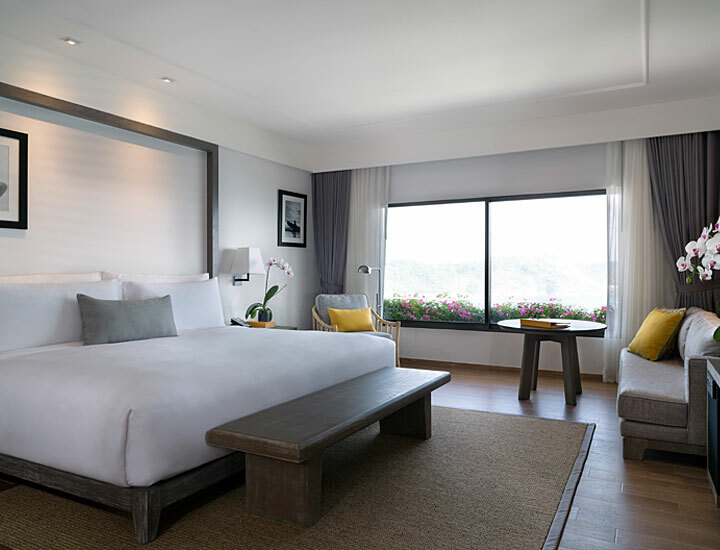 Each suite features one spacious bedroom and the option to enlarge the suite by connecting to an adjoining room. Guests of Royal Ocean View Suites receive dedicated service by their own personal butlers. These suites offer a foyer, living area, dining area with seating for four people and walk-in closet. Each bedroom features an oversized king bed with down and feather pillows and a plush mattress topper. It’s draped in exquisite 300-thread-count cotton linens for ultimate comfort. The bathroom, with rainforest showers and stand-alone bathtubs, offer space to relax and rejuvenate after a day at the beach. Rooms open to an expansive terrace with a canopied four-poster daybed with privacy curtains that can be drawn when needed. It offers panoramic views over the bay and stands in reach of the famous ‘Press for Champagne’ button. Interactive, high-definition TV sets features 55-inch flat screens and are supported by a BOSE Sound System with Bluetooth connectivity. High-quality loose TWG teas and Illy capsule coffee machine complete an extensive minibar offering.